Stator blade in the turbine stage of a jet engine is heated by combustion gases, where the resulting temperature gradients introduce significant stresses. To prevent the stator from melting, air is passed through a cooling duct in the blade. COMSOL Desktop®: A mechanical simulation of a wrench computing the effective stress and deformation. Simulation of fluid flow and chemical transport in a micromixer. Shown is the fluid velocity field and species concentration. COMSOL Desktop®: An electrical simulation of a pacemaker electrode with computed voltage and current distribution. The COMSOL Desktop is a powerful integrated user interface environment designed for cross-disciplinary product development with a unified workflow for electrical, mechanical, fluid, and chemical applications. COMSOL Multiphysics® is a general-purpose software platform, based on advanced numerical methods, for modeling and simulating physics-based problems. With COMSOL Multiphysics, you will be able to account for coupled or multiphysics phenomena. With more than 30 add-on products to choose from, you can further expand the simulation platform with dedicated physics interfaces and tools for electrical, mechanical, fluid flow, and chemical applications. Additional interfacing products connect your COMSOL Multiphysics simulations with technical computing, CAD, and ECAD software. COMSOL Desktop® is a powerful integrated environment designed for cross-disciplinary product development with a unified workflow, regardless of the application area. The add-on modules blend in seamlessly with COMSOL Multiphysics, and the way you operate the software remains the same no matter which add-on products are engaged. The model tree in the Model Builder gives you a full overview of the model and access to all functionality – geometry, mesh, physics settings, boundary conditions, studies, solvers, postprocessing, and visualizations. With COMSOL Multiphysics you can easily extend conventional models for one type of physics into multiphysics models that solve coupled physics phenomena – simultaneously. What's more, accessing this power does not require in-depth knowledge of mathematics or numerical analysis. With COMSOL Multiphysics® FEA software, you can simulate virtually anything you want, thanks to the underlying flexibility that complements the intuitive and easy-to-use COMSOL Desktop® interface. 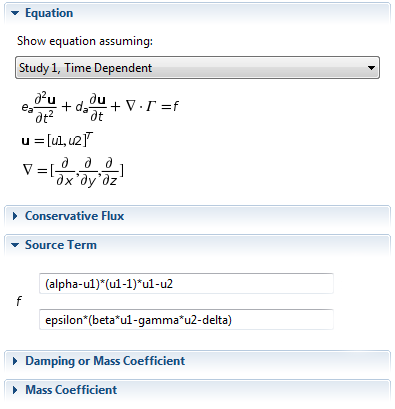 For instance, in COMSOL Multiphysics®, you are able to arbitrarily include your own equations that may describe a material property, boundary, source or sink term, or even a unique set of partial differential equations (PDEs). You can then create new physics interfaces from the equations you entered. When creating apps with the Application Builder, you can design your own user interfaces based on your models. These user interfaces can be simplified versions of the model or include only some of the input and output fields you want to give the user of the app access to. COMSOL Multiphysics® also includes a COMSOL® API for use with Java® that adds extra flexibility for connecting your COMSOL Multiphysics® models with other applications. Using COMSOL Multiphysics provides you with a significant amount of physics modeling functionality, including multiphysics ability. By adding application-specific modules, the modeling power is increased with dedicated tools for electrical, mechanical, fluid flow, and chemical applications. COMSOL Multiphysics includes a set of core physics interfaces for common physics application areas such as structural analysis, laminar flow, pressure acoustics, transport of diluted species, electrostatics, electric currents, heat transfer, and Joule heating. These are simplified versions of a selected set of physics interfaces available in the add-on modules. For arbitrary mathematics or physics simulations, where a preset physics option is not available, a set of physics interfaces are included for setting up simulations from first principles by defining the equations. Several partial differential equation (PDE) templates make it easy to model second-order linear or nonlinear systems of equations. By stacking several equations together, you can also model higher-order differential equations. These equation-based tools can further be combined with the preset physics of COMSOL Multiphysics or any of the add-on modules, allowing for fully-coupled and customized analyses. This dramatically reduces the need for writing user subroutines in order to customize equations, material properties, boundary conditions, or source terms. Also available is a set of templates for classical PDEs: Laplace's equation, Poisson's equation, the wave equation, the Helmholtz equation, the heat equation, and the convection-diffusion equation. Users enjoy the ability to define any number of local coordinate systems. There are shortcuts for common coordinate systems such as cylindrical, spherical, and Euler-angle based, and a method for automatic coordinate system creation makes it easy to define anisotropic material properties that follow curved geometric shapes. This curvilinear coordinates tool, included in COMSOL Multiphysics, can be applied for any type of physics, like anisotropic thermal conductivity in heat transfer, orthotropic materials for structural mechanics, and anisotropic media in electromagnetics, for example. The COMSOL Desktop® allows you to work simultaneously in 3D, 2D, 1D, and 0D. So called Model Couplings can be used to map any quantity across spatial dimensions. For example, a 2D solution can be mapped to a 3D surface or extruded throughout a 3D volume. This functionality makes it easy to set up cross-dimensional simulations. Furthermore, systems of algebraic equations, ordinary differential equations (ODEs), or differential algebraic equations (DAEs) – referred to as 0D models – can be combined with spatially dependent 1D, 2D, and 3D models. Partial Differential Equations: An equation-based model of electrical signals in a heart, solving a system of transient nonlinear partial differential equations. COMSOL Multiphysics includes advanced moving mesh functionality, based on the Arbitrary Lagrangian-Eulerian (ALE) method, where you can define physics with respect to a moving frame of reference. This can be either a material frame or a spatial frame depending on what is relevant for the physics at hand. The technology is also included in some of the add-on modules, where moving meshes are coupled to other physics: fluid-structure interaction (Structural Mechanics Module and MEMS Module), corroding surfaces (Corrosion Module), electrodeposition (Electrodeposition Module), electromechanics (MEMS Module), and two-phase flow (Microfluidics Module). The ALE functionality included in COMSOL Multiphysics also makes it possible to perform custom-built simulations in cases where a built-in option is not available. Automatic and semi-automatic meshing tools are available in COMSOL Multiphysics, including free tetrahedral meshing and swept meshing. The default algorithm is automatic tetrahedral meshing for physics defined in solids, and a combination of tetrahedral and boundary-layer meshing for fluids. You can also take full control over the sequence of operations used for creating the mesh by defining a so-called mesh sequence. A mesh sequence allows for a mix of tetrahedral, prismatic, or hexahedral elements and can be made parametrically driven. In addition, when importing a mesh on one of the NASTRAN formats, pyramid elements are also supported. A mesh imported on the NASTRAN format can be subsequently partitioned on the domain, boundary, and edge levels by additional coordinate-based operations. COMSOL's unique approach to multiphysics separates the geometric shape (in 3D: tet, prism, hex, pyramid) of the finite elements from the "finite element shape functions". This provides maximum flexibility, and each geometric shape supports first, second, third, and, in some cases, higher-order shape functions, corresponding to traditional linear, quadratic, or cubic finite elements respectively. Many types of physics utilize Lagrange finite elements, also know as isoparametric nodal-based finite elements. This includes heat transfer, structural mechanics, electrostatics, and more. For CFD, specialized elements and numerical stabilization schemes are also used. 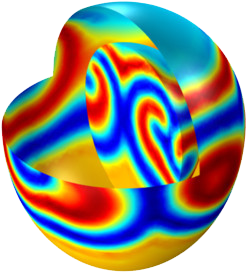 For vector-field electromagnetics, curved and higher-order curl elements, also known as edge or vector elements, are used. Meshing: The meshing methods of COMSOL Multiphysics includes free tetrahedral mesh, swept mesh, and boundary layer mesh. The picture shows the mesh of a flow simulation using higher-order elements. COMSOL Multiphysics provides 1D, 2D, and 3D geometry modeling tools with a COMSOL native geometry kernel. A number of primitive objects are available, as well as the capability of extruding general 2D geometry objects into 3D. Additionally, 2D objects can be revolved or swept along parametric curves. Boolean operations such as union, difference, and intersection are used to form more complicated shapes involving combinations of solids, surfaces, curves, and points. Free form modeling capabilities include parametric surfaces, parametric curves, and interpolation curves. All geometry operations are organized in a parametric sequence of operations in the Model Tree. For access to more advanced CAD functionality, there are the add-on CAD Import Module and the LiveLink™ products for CAD. These boost the geometry modeling capabilities by including the Parasolid® geometry kernel, and they provide a range of CAD import/export formats as well as CAD interoperability with leading CAD systems. For a list of geometry modeling functionality and import/export formats, see the CAD Specifications page. Geometry Modeling: COMSOL Multiphysics includes a geometry modeling engine that allows for parametric models in 1D, 2D, and 3D. More advanced geometry modeling is available with the CAD Import Module and the LiveLink products for CAD. COMSOL Multiphysics assembles and solves models using state-of-the-art numerical analysis methods. Several different methods are used in the add-on modules, including finite element analysis, the finite volume method, the boundary element method, and particle tracing methods, but the emphasis of COMSOL Multiphysics is on the finite element method. Many types of finite elements are available, and fully coupled elements are automatically generated by the software at the time of solving. This patented method of generating finite elements "on-the-fly" is precisely what allows for unlimited multiphysics combinations – something that is unique to COMSOL Multiphysics. The physics software runs the analysis together with adaptive meshing (if selected) and error control using a variety of numerical solvers: direct and iterative sparse matrix solvers, algebraic and geometric multigrid methods, as well as a range of preconditioners. Solver defaults are used that depend on the physics combinations. The user can view the solver settings and also manually configure low-level settings. When available, the solvers and other computationally intense algorithms of any COMSOL license make use of multicore computing. Cluster and cloud computing are enabled by the floating network license option. A set of solvers is organized in a higher-level Study; one Study can hold a sequence of solvers, such as for stationary, eigenfrequency, frequency-domain, and time-dependent analyses. The application-specific modules have additional solver options, such as those for pre-stressed or small-signal analysis, and combined frequency and time-domain analysis. Sensitivity analysis is included in COMSOL Multiphysics and a suite of optimization solvers is available in the add-on Optimization Module. COMSOL creates sequences to record all steps that create the geometry, mesh, studies and solver settings, visualization, and results presentation. You can therefore easily parameterize any part of the model, by simply changing a node in the Model Tree and re-running the sequences. The program remembers and reapplies all other information and data in the model. In addition, the connection between the geometry and the simulation settings is fully associative – a change in the geometry will automatically propagate changes throughout the model. If you prefer a command-driven environment, you can also run COMSOL Multiphysics in batch mode. Parametric Models: Models can be parametric with algebraic relationships between parameters. Parameters can represent geometric dimensions as well as physical properties. 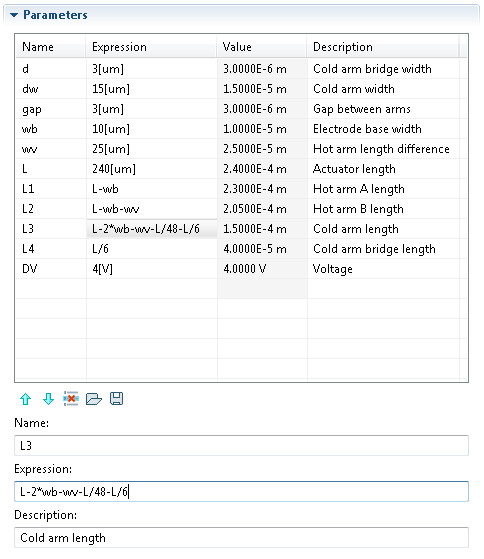 COMSOL Multiphysics comes with a built-in interpreter for mathematical expressions. Expressions can be assigned to variables for later use in material properties, boundary conditions, or sources. This means that most of the time you do not need to write code to adapt the software when there is a need for a custom expression. The coordinate variables x, y, and z can be used to define spatially varying quantities, for instance, distributed loads. In a similar way, lowercase t is reserved for time, and can be used in expressions to shape time-varying pulses for transient simulations. A number of operators are available for smoothing, linearization, differentiation, and more. In addition to a set of built-in function templates, like Gaussian and rectangle pulses, you can define look-up table functions either directly in the COMSOL Desktop® or read them from file. Inhomogeneous material properties can be represented by referencing a volumetric look-up table with properties as a function of spatial coordinates. As an alternative to numerical tables, you can use image data on a number of common image formats as a basis for an interpolation function. This can, for example, be used to map image pixel values to material property values. You can also combine mathematical expressions with function calls into composite expressions involving both types. For representing topographic geometry data, you can import digital elevation map (DEM) data and use it in combination with parametric surfaces. Variables and Expressions: The COMSOL Desktop® allows you to define and use variables with expressions in unknown field components, their derivatives, spatial coordinates, and time. The Application Builder allows you to quickly create specialized and easy-to-use simulation apps based on your COMSOL Multiphysics models, for use by your colleagues and customers. The Application Builder desktop environment provides two important tools for creating apps: The Form Editor and the Method Editor. The Form Editor includes drag-and-drop capabilities for easily accessing and including user interface components such as input fields, graphics windows, and buttons. The Method Editor is a programming environment that allows you to modify the data structure representing a COMSOL Multiphysics model. In this editor, Java® code can be written to extend and enhance the user experience of a simulation app. Applications can be created in the Windows® version of COMSOL Multiphysics® using any of the features and functionality from the simulation platform and its add-on products. These can then be run using either a license of COMSOL Multiphysics or COMSOL Server™, which supports the add-on products that were used to create the original app. COMSOL Server™ does not include the Application Builder, Physics Builder, and Model Builder tools that come with the COMSOL Desktop environment. Apps can be run from COMSOL Desktop® in the Windows®, Mac OS X, and Linux® environments. For running apps from a different machine than where COMSOL Server™ resides, you can download COMSOL Client for Windows® from the download page (requires COMSOL Access) on COMSOL’s website and install it to your native Windows® environment. The COMSOL® client enables you to run apps that have been built using any of the LiveLink™ for CAD programs. It also supports better graphics performance and rendering, allows you to include the ribbon interface in your apps, and provides the same look-and-feel of the COMSOL Desktop® environment. Alternatively, apps may be run using a standard web browser on platforms such as Windows®, Mac OS X, iOS®, Linux®, and Android™ with a COMSOL Server™ license. Watch the Video: See how the Application Builder and COMSOL Server™ enhance the simulation modeling workflow. The COMSOL Desktop environment and Application Builder make it easy for you to customize your models and apps. For more advanced customization, there are also a number of different Application Programming Interfaces (APIs) available to extend your modeling. The COMSOL® API for use with Java® is included with COMSOL Multiphysics® and provides a programmatic way to manipulate and drive the software through compiled object-oriented code. Alternatively, LiveLink™ for MATLAB® allows you to work with COMSOL Multiphysics® in combination with the MATLAB® technical computing language. Getting started with the COMSOL® API for use with Java® and LiveLink™ for MATLAB® is almost immediate, as you can easily save a model that has been set up in COMSOL Desktop® to the Java® or MATLAB® file formats, respectively. The Physics Builder, which is also included in COMSOL Multiphysics, allows you to create your own physics interfaces using the COMSOL software’s equation-based modeling capabilities. You can extend the physics modeling capabilities by creating interfaces within COMSOL Desktop that have the same look and feel as the pre-packaged physics interfaces. To achieve this, you work directly in COMSOL Desktop from the Physics Builder tree to define new user interface components -- no programming required. Results can be exported to text files on the .txt, .dat, and .csv formats. With LiveLink™ for Excel®, results can be exported to the Microsoft® Excel® .xlsx format. Images can be exported to several common image formats, while animations can be exported to Animated GIF, Adobe® Flash, or AVI. Get more details on export file formats. Reports summarizing the entire simulation project can be exported to HTML (.htm,.html) or Microsoft® Word® (.doc) format. Three default report choices are available: Brief, Intermediate, or Complete. However, you can also choose to build customized reports from the different parts of the Model Tree. Report Generation: Reports summarizing the simulation can be output to HTML or Word® format. Visualization capabilities include surface, slice, isosurface, cut plane, arrow, and streamline plots, as well as many other plot types. Visualizations are not limited to built-in quantities, but can be expanded with composite physical quantities by typing mathematical expressions in the unknown field variables, as well as their derivatives. As a result, you can visualize just about any quantity of interest related to simulation results. A range of postprocessing tools are available for evaluation and integration. You can compute the max, min, average, and integrated values of any quantity or composite quantities, throughout volumes, on surfaces, along curved edges, and at points. Visualization: Built-in visualization tools include surface, slice, isosurface, cut plane, arrow, and streamline plots, as well as graphs. The image shows the sound pressure level in an automotive muffler as a surface color plot (top) together with the transmission loss vs. frequency (bottom). COMSOL Multiphysics is a flexible platform that allows users to model all relevant physical aspects of their designs. Expert users can dig deeper and use their knowledge to develop customized solutions, applicable to their unique circumstances. With this kind of all-inclusive modeling environment, COMSOL gives you the confidence to build the model you want with real-world precision. Certain characteristics of COMSOL become apparent with use. Compatibility stands out among these. COMSOL requires that every type of simulation included in the package has the ability to be combined with any other. This strict requirement mirrors what happens in the real world. For instance, in nature, electricity is always accompanied by some thermal effect; the two are fully compatible. Enforcing compatibility guarantees consistent multiphysics models and the knowledge that you never have to worry about creating a disconnected model again. Another noticeable trait of the COMSOL Desktop® is adaptability. As your modeling needs change, so does the software. If you find yourself in need of including another physical effect, you just add it in. If one of the inputs to your model requires a mathematical formula, you can just enter it. Using tools like parameterized geometry, interactive meshing, and custom solver sequences, you can quickly adapt to the ebbs and flows of your requirements. The flexible nature of the COMSOL Desktop environment facilitates further analysis by making “what-if” cases easy to set up and run. You can take your simulation to the production level by optimizing any aspect of your model. Parameter sweeps and objective functions for optimization can be executed directly in the user interface. From start to finish, COMSOL Multiphysics is a complete problem-solving tool. COMSOL, COMSOL Multiphysics, COMSOL Desktop, COMSOL Server, and LiveLink are either registered trademarks or trademarks of COMSOL AB. MATLAB is a registered trademark of The MathWorks, Inc. Microsoft, Excel and Windows are either registered trademarks or trademarks of Microsoft Corporation in the United States and/or other countries. Java is a registered trademark of Oracle and/or its affiliates. Parasolid is a registered trademark of Siemens Product Lifecycle Management Software Inc. or its subsidiaries in the United States and in other countries. Mac, Macintosh and OS X are trademarks of Apple Inc., registered in the U.S. and other countries. Linux is a registered trademark of Linus Torvalds. Android is a trademark of Google Inc. iOS is a registered trademark of Cisco in the U.S. and other countries. NASTRAN is a registered trademark of NASA. All other trademarks are the property of their respective owners, and COMSOL AB and its subsidiaries and products are not affiliated with, endorsed by, sponsored by, or supported by those, or the above, non-COMSOL trademark owners. For a list of such trademark owners, see www.comsol.com/trademarks. Mesh partitioning of domains, boundaries, and edges. Import and export of text, Excel, image, movies, meshing, and CAD formats in COMSOL Multiphysics and add-on products are listed below. 2Import supported on Windows® operating systems only. What exactly is COMSOL Multiphysics anyway? COMSOL Multiphysics is a simulation environment designed with real-world applications in mind. The idea is to mimic as closely as possible effects that are observed in reality. To do this, there is the need to consider multiphysics.